I went to TJMaxx a couple days ago and saw these beautiful shells in bottles. They were between $7-13 each. Since I have my whole beach theme going on, I knew I could make a couple for the price of one. I snapped a pic with my phone and walked to Michael’s next door for craft materials. The materials (including bottles) were less than $15.00. 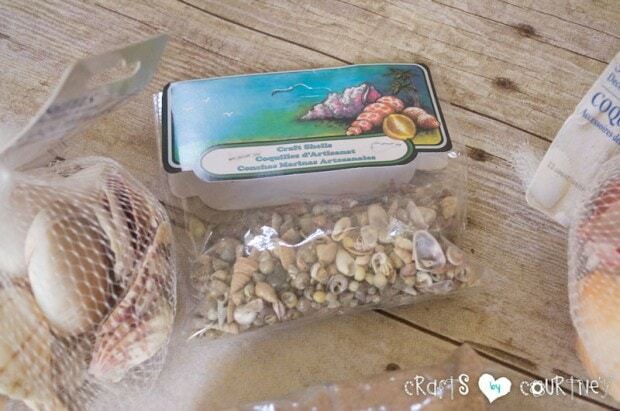 I grabbed a bag of larger shells at the Dollar Tree for the tops. Michael’s has all the supplies for these super simple shell bottles. I was able to use my “Handy Dandy” 40% coupon on the mini shells and decorative sand. Gotta love that right?? AND, I got the bottles for $1.20 each!! They had cork on the tops (just like the ones at TJMaxx)! I decided to just use hot glue to add the shells to the tops of the corks. It dries super fast and is very sturdy. I added a good amount of hot glue to the cork and placed my shell firmly on top of the glue. Held it for a minute and voila the first part was done! I used a funnel and added the sand about halfway up the bottle. Then, dropped a little handful of shells on top. 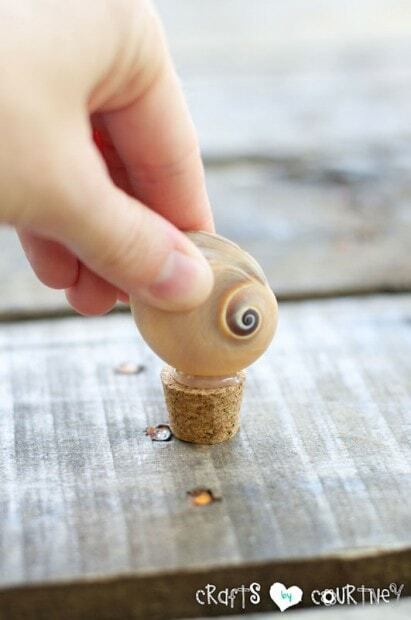 Quick Tip: Make sure NOT to cover any of the shells with sand (I was pretty careful moving them). This will keep the look we want. I had this cake stand that I thought the bottles looked perfect on. Then, I scattered some beautiful starfish around them. It took me less than 10 minutes and I made these beautiful bottles for less than $15. Now that’s what I’m talking about!! They just look beautiful in my china cabinet. 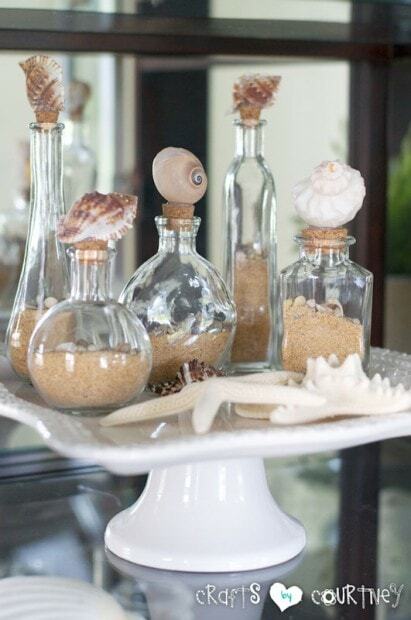 Now I’m inspired to decorate my whole china cabinet around them…wonder what I’ll come up with next? I think my beachy themed china cabinet looks great!! I know most people would have just bought the ones at TJMaxx, but I just love crafting on a budget. I totally got my crafting fix with this one!